Jill McKeever is the proprietress of independent natural niche line For Strange Women. She's from Kansas City, MO, and has a brick and mortar store there as well. Click HERE to read a short article about Jill and For Strange Women from The Kansas City Star online. My fellow perfume enthusiast and writer Nathan Branch decided to send me some goodies to review from For Strange Women. 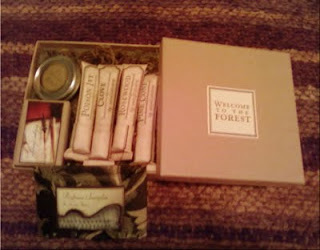 When I unpacked them, I was greeted with the phrase "Welcome to the Forest" printed on the outside of the box, which instantly made me smile. I was struck by how pretty and thoughtful the presentation was. Equal parts rustic and Victorian, each sample vial comes with a beautiful card explaining the intention of the scent. For Strange Women is an eco-minded brand, and proves that that doesn't need to mean tacky, pretentious or boring. I don't always actively seek out Earth-friendly products, but when given such aesthetically pleasing and quirky options such as these, I will happily go for the quirky stuff. Lip Embellishment Gift Set: For Strange Women's Lip Embellishments are lip balms with outrageously good fragrances and interesting packaging. My husband immediately grabbed the Poison Ivy for himself, and I went for the Pine Cone. At first, the wax can be a bit stiff, but I find that it melts with body temperature to spread more easily. I recommend heating it up by rolling it between your palms for a minute before using. The packaging is made with a biodegradable and compostible cardboard-like tube and printed with soy ink, with a cap you pull off. The lip balm is 100% natural, containing beeswax, cocoa butter, sweet almond oil, jojoba oil, meadowfoam, tocopherol, stevia extract, essential oils (that differ depending on which one you have), rosemary extract and mica. It reminds me a bit of the kind of popsicle that you push up out of the long, clear wrapper to get to the goods. The scents are brilliant and include Poison Ivy, Clove, Pine Cone and Rosewood. They are effective lip protectants and very emollient, and despite the inclusion of stevia, you can barely taste any sweetness- just a tiny hint. Perfect! A set of 4 come in a gift box for $24, or they are $6 individually. Perfume Enhancing Fixative Base: This waxy base comes in a tin, and the idea is that you apply it before using natural perfume oils to help them last longer on your skin. The directions are: apply to skin, wait three minutes, then apply perfume. It forms a barrier so that the oils don't get sucked up by your skin immediately. It is made from shea butter, cocoa butter, beeswax and vitamin E. The base does indeed help to make the fragrances last longer, and if you generally apply natural perfumes in the morning before work and don't really touch it up during the day, this is something that could be really helpful in extending the fragrance. The tins of Perfume Fixative Base come in two sizes, for $8 and $18. I love the concept of the Fauna Cologne trio. They are all-natural and are named after animals. These fragrances have an oil base (jojoba and coconut), and are rather mysteriously referred to as colognes. They are not traditional colognes- instead, I believe the word is used to imply that these are more masculine fragrances. There is a 25% fragrance concentration to the Fauna Colognes, and they are all pretty tenacious, especially for natural compositions. Individual bottles of each scent are available, 8ml for $46, or you can get a sample trio for $18. Horse: Let me just get this out of the way first: I am ALL about Horse. Horse is everything. My kingdom for a Horse? Yes, please. This is a very rich, deep hay fragrance- fresh and comforting. It is animalic in the way that I hope everything labeled an "animalic" fragrance will smell, but rarely does. There is saddle leather present, and even the saddle wax that goes on it. It really takes me back to when I was a kid, hanging out at my mother's horse barn. While including all the elements that make us Barnyard Chic Freaks titter with excitement, Horse manages to mostly focus on the sweat-covered skin of the horse itself after just having been for a long run. It's an emotionally tender scent for me, and frankly, it almost makes my eyes well up with tears. Horse has the kind of imagination contained within it that you don't see very often. It has a linear development, but that's a positive thing here. Everything is present all at once and it just fades as a whole over time. Once it dries down in the extreme, it's very much a dry hay scent. Horse is completely enchanting, I will need a bottle of this. Coyote: Coyote is meant to evoke the warm fur of this elusive canine creature. Coyote starts and finishes in the masculine realm. Bay is one of those things that are rarely (if ever) used in feminine perfumes, and the bay is fairly strong here and stays throughout the entire wearing. The neroli and bergamot give a nice little citrus acidity to the blend, and after about 10 minutes go by, the warm fur accord emerges. It is not "wet dog" kind of animalic fantasy accord, so it's not quite as literal as Horse feels. 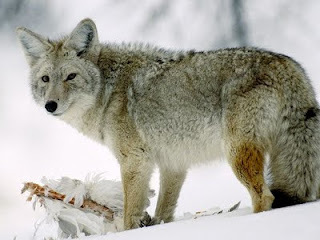 Coyote is a dry, aromatic fougere with the fur element represented by a musky, woody combination. There is a smokiness that is not overwhelming nor does it give smoked meat or barbecue, thankfully. It is a slightly bitter, dry wood smoke. I think Coyote is very nice, but its classic, masculine fougere nature is not something I would reach for frequently (especially since now I can easily make myself smell of Horse). Sand Dollar: Sand Dollar comes out of the gate with a lovely pine and lime combination. I'm not usually partial to aquatic themes in perfume, but this one is not your run of the mill Cool Water type of aquatic. The fact that Sand Dollar is all natural works in its favor. Again, there are several fantasy accords here (salty citrus? Ocean pine?). I do get the salty sea thing, but it's not overbearing. The citrus really pops, lending a nice contrast to the pine, and in the end, citrus and pine is what I remember most about this fragrance. 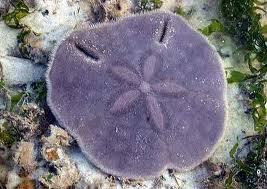 I forget that a sand dollar is a living creature, maybe because I've never seen one in person that I can recall. Almost everyone has held the dried-up skeletal remains of one before, but contemplating this perfume has reminded me that the Fauna collection is about the living wonders of the world- animals and creatures of all kinds and sizes. When I'm not thinking about perfume, I can always be caught thinking about animals. I still have samples of several more For Strange Women perfumes to try, and based on my opinion of what I've tried so far, I'm looking forward to it. There is much fun to be had with this line, and it won't cost you dearly. Horse sounds great! How does it compare to L'Artisan Dzing? (Can they even be compared? Dzing has spices and a sweetness to it that Horse doesn't seem to have...) Thanks, I have to try it! Hi Alnysie- it's been a long time since I've sniffed Dzing, but because Horse is natural, I'm sure the differences are many. I can say that Horse has only the natural sweetness of hay, there's no vanilla in it or anything like that. I don't think Horse will be for everyone (it's definitely the most potentially challenging to wear of the trio) but I think it's just gorgeous. This is fascinating. Growing up, I used to dream of living on a ranch, until I actually went horseback riding and got a whiff of real horses. The dream sort of died then. 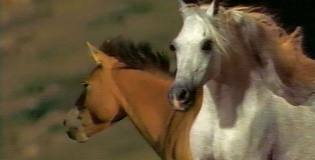 But I can understand how appealing Horse must be, especially if it evokes a dear memory. I had so much fun reading this post. I've been curious about this line for quite some time. After reading your reviews, I simply must try it. Besides the pine cone and clove lip embellishments, Horse MUST be mine. Isn't it incredible when scent moves you emotionally? I love the opening "For Strange Women".....really made me pause. This is a unique concept, not so much as a whole as there are others out there espousing similar values, but all the elements are there, yet placed together in such an elegant way, as well as all the products seeming exceptionally well thought out. Now, as to the scents themselves, while I would normally gravitate to something closer to 'coyote' (the animal), that wold primarily be because it is close to the wolf, which happens to be an absolute love of mine (again, the animal! ), and having had no barnyard chic experience of my own to speak of, it goes without saying that I might easily bypass something labelled 'horse'. But Carrie, my dearest, once more, your prose has stirred up new feelings in me and has made me quite curious as to what this 'Horse' would be like....I actually think I may even like it!! Lovely, lovely post! I wonder about the Perfume Enhancing Fixative Base. Do you have any idea how the perfume ages while being applied over it? Does it get stuck in it's initial state or does it mature as usual, only slower? Joanne: you need Horse! Even if you don't love it enough to wear it regularly, I think you'd be able to appreciate the uniqueness of it. 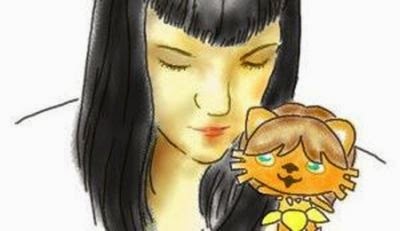 Eugenia: I'm so glad you enjoyed the review! I do hope you end up trying some samples, I bet you'd be happy with them. flavourfanatic: with the fixative base, I don't find that it really affects the progression of the scent's development. With natural essences like these, the complexity tends to happen all at once and just fade down, as opposed to synthetic or blended perfumes which can vary widely as time goes on. Absolutely LOVE the Sand Dollar concept!! The whole line (as presented) looks mighty intriguing! Hi Dabney! I haven't even tried most of what I want to from this line- there are the brass Victorian perfume lockets, and the bath salts sound so nice, too. There are so many wonders yet to discover with small companies, it gives a different kind of thrill than talking about mass-market stuff. Just came across your blog by accident, and I'm a first-time reader/poster, but wanted to say that your descriptions of these fragrances were awesome! I've been a fan of 'For Strange Women' for quite some time, and have never tried any of her scents but reading this just got me a whole lot closer to ordering a sample-pack. See, Nathan has to be declared a saint somehow! I absolutely need that fixative base and the Fauna trio. I know you told me I would love it a few weeks ago, but your review...well, it just cemented it for me. I think I just need to spring for samples of all of her fragrances. Coyote is going to haunt my dreams tonight, oh wow. 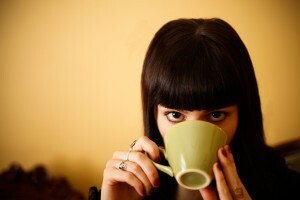 Heidi- glad you found my blog! Thanks for reading and commenting. Joey- I would highly suggest you pick up samples of the Fauna trio. Horse is definitely haunting my dreams these days! Do you know Cartier L'Heure Fougueuse? How does it compare to Horse? Birgit- SO funny you should bring up L'Heure Fougueuse, I just got my b-day package from Sheila today, and there is a sample of it in there! I just sprayed some, and Horse isn't too similar, but damn, is L'Heure Fougueuse impressive! The hay elements are very different, in the Cartier, it is drier and grassier, like sweetgrass. In Horse, it's a sweatier, fresher hay. I like he concept and the packaging, the store in the half empty western city vibe, the persona, everything, and I ordered samples awhile ago on the name alone, but so far sadly not getting it. I find they (a different selection from yours) don't register above a very faint whisper, even more faint than other all naturals I make sure to make a quiet clean space for. Perhaps my batch lost their fragrance in shipping. I know with naturals you really have to use them quickly and keep them tightly sealed or they lose fragrance. I will have to see about getting more. I do so want to love. Cartier L'Heure Fougueuse - one of the BEST perfumes ever! Lucy- I gave the other scents I have from FSW a cursory sniff, and I must say that the Cologne trio is much more tenacious, the concentration is pretty high. I almost always have problems with naturals in oil bases not registering above a whisper on my skin, sometimes I think they would make better body oils for after bath/shower. :) Nothing wrong with that, except it would get expensive fast. Joanne- you got that right! Where have I been, anyway? I'd all but written Cartier off for fragrance, seems I overlooked an important one. I'm not the one whose eyes bright up or get watery on the mentioning of "all-natural", "Earth-friendly", "bio-something" and such - sometimes even the opposite (not that I would try to be wasteful or harmful on purpose). But the way you described this brand momentarily made me want to try it. I want the same things as JoanElaine wants - cone, clove and horse. I'm with ya, Undina! It's just so nice to have lip balms fragranced with scents I would choose myself. Lip balms are a small thing, but they can brighten your mood up temporarily! Carrie, thanks for this review of Jill's newest perfume oils. I've been wanting to try them and may do that very soon. I especially am interested in Horse - I love your analysis of this one in particular. I was surrounded by horse farms and tobacco barns growing up and truly miss these smells. I've been following For Strange Women since Jill was a featured seller a couple of years ago. Her shop is luxurious and warm and just feels like the ultimate place for comfort. Her overall presentation is perfect and timeless. Jill's attention to detail is everywhere. I've only tried three samples from her and from these, Winter Kitty is my favorite - it's simply hypnotic, especially the first few minutes that are like a cold and blustery day when there's snow on the ground, but it's not actually snowing. I'm a Paula's Choice Skin Care Superfan! If you're tired of messing around and want products that work well and work fast, start here. Get $10 off your 1st purchase if you're a new customer and you click on my REFERRAL LINK-- I get $10 too. Note: I'm not affiliated with Paula's Choice, I just really believe in them and love their Refer-A-Friend Program! 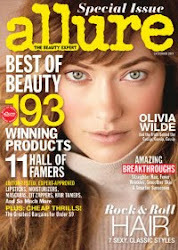 Also mentioned on Allure.com Daily Beauty Reporter in "Twitter: a Great New Beauty Resource" on June 24, 2011 and again on September 28, 2011 in "Fall's Most Anticipated Fragrances"
I prohibit any and all content curation without express permission. Sending samples does not guarantee a review. 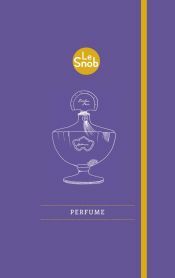 Perfumer interview series starting soon! Copyright 2010-2014 Eyeliner On A Cat all rights reserved. Powered by Blogger.